Dubai, UAE, May 9, 2017: Astronomy and horology are closely bound together and represent the very foundations of time measurement. While astronomy revolves around studying the solar system, horology is the art of measuring time; and these two disciplines have witnessed a perfect marriage in Vacheron Constantin’s celestial timepieces. Right from the early days, astronomers would review sundials and track lunar cycles to create calendars or determine significant religious dates and even today, the Holy Month of Ramadan is announced after the sighting of the new moon. Vacheron Constantin has channeled poetry, heritage and innovation in creating a collection of complications par excellence that not only capture the beauty of the night sky but also carry the intricacies of the heavenly bodies that reside there; From a groundbreaking new complication to artistic pieces of art and sophisticated elegance on your wrist. In 2017 the Maison unveils horological landmarks in the field of astronomical accuracy. A one-of-a-kind piece with 23 mainly astronomical complications displays the civil time, the solar time and the sidereal time. It is one of the world's most complicated wristwatches, a milestone for Vacheron Constantin and the source of inspiration for further astronomical timepieces such as a tourbillon with an equation of time, equipped with sunrise and sunset times for the city of Riyadh and for several expressions of astronomical features among which perpetual calendar and moon phase in the traditional collections. This impressive feat of miniaturisation features a combined display of civil, solar and sidereal times, each with its own gear train. Its new fully integrated caliber is a pinnacle of technical sophistication with its 514 components measuring a total of only 8.7 mm thick. 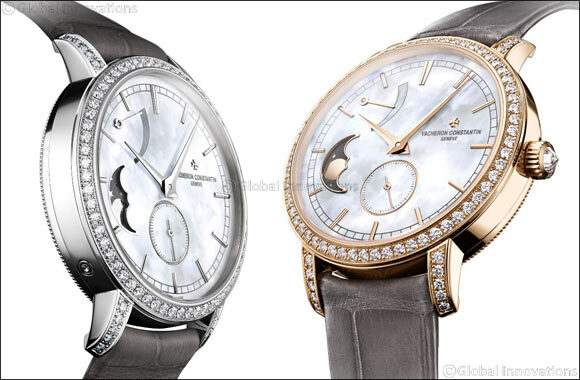 Les Cabinotiers Celestia Astronomical Grand Complicationn 3600 features a total of 23 complications on its twin sides. On the mainplate (front) side, the dial displays civil time indications (including a perpetual calendar with a precision moon phase), solar time indications and a mareoscope with Earth-Moon-Sun alignment. The bridge side (back dial) features an innovative and transparent celestial chart indicating sidereal time, for which a patent has been filed. The 'running' equation of time is extremely rare due to its complexity and enables instant reading of true solar time by means of an additional coaxial minute hand. To ensure exactitude and precision, Vacheron Constantin has developed a tropical gear train simulating the tropical year, to which the solar hand is set. This complication is an authentic watchmaking feat for which a patent has been filed. A celestial chart of the Northern Hemisphere has been created on the back of this mechanical masterpiece. Indicating the constellations, the Milky Way as well as projections of the celestial equator and the ecliptic, this sky map was devised in an innovative way involving two superimposed transparent sapphire discs. This construction, for which a patent has been filed, makes it possible to admire the finishing of Caliber 3600. The finely grained bridges and the transparent jewels are designed to ensure optimal legibility of sidereal time. This new timepiece, with its pure lines typical of the Patrimony collection, features a dial on which the cycle and age of the moon can be read off through an opening in the lower half of the dial. This complication is displayed in accordance with the real cycle of the moon around the earth, which amounts to exactly 29 days, 12 hours and 45 minutes. This sophisticated mechanism requires only one correction every 122 years. Vacheron Constantin is combining this elegant complication with a retrograde date indication, graduated from 1 to 31 across the upper dial arc. A central blackened gold hand tipped with an openworked arrow moves forward in one-day increments. Once the month has elapsed, the hand returns to its initial position on the 1 numeral by means of a retrograde system and begins running along the same path. The silvered opaline dial, subtly raised around the rim, features tapered applied hour-markers in pink or white gold depending on the versions, as well as a circular “pearl” minute-track. The emblematic Maison logo on the dial, the slim hands, as well as the pin buckle of the alligator strap, are all crafted in pink or white gold according to the model. Equipped with a Manufacture movement, the Patrimony moon phase and retrograde date is certified by the prestigious Hallmark of Geneva, a sure token of excellence. Introduced in the Traditionnelle collection, this ladies’ model ties the purest watchmaking traditions with a timeless classic spirit. The hand-wound calibre, entirely developed and crafted at Vacheron Constantin, features one of the most poetic of all Fine Watchmaking complications: moon phases. Equipped with a high-precision gear train, the sophisticated mechanism of this function requires a single-day adjustment only once every 122 years. In addition to displaying the hours, minutes, small seconds and moon phases, this Manufacture movement offers a pointer-type indication of its over 40-hour power reserve. The charm of a shimmering white mother-of-pearl dial is framed by the dainty curves of a 36 mm-diameter round case set with 81 diamonds for a total of approximatively 1.2 carats. With its original display and spectacular decoration, this new collection inspired by mathematician and philosopher Nicolas Copernicus, pays tribute to one of humankind’s greatest discoveries: heliocentrism. The M�tiers d’Art Copernicus celestial spheres 2460 RT collection testifies more eloquently than ever to the creativity of the Vacheron Constantin master-artisans. They have dreamed up three dials with different interpretations of the same theme: the graphic depictions of the 17th century Dutch-German cartographer Andreas Cellarius most important colorful sky map “Harmonia Macrocosmica”, with its splendidly baroque style. The dials of the collection comprise two distinct parts. The oval centre bears a Sun with a glowing hand-engraved pink gold face, while the outer disc is dedicated to three decorative craft variations. Between the two, a tiny elliptical groove provides space to display orbit performed by the Earth. The first model in this trio gives pride of place to various enamelling techniques, the second dial, graced with an even more baroque-inspired aesthetic, is hand-engraved while the third dial is adorned with decorative techniques involving several novel aspects incl. innovative laser technique to sculpt the symbols that the engraver then works over entirely by hand so as to accentuate the raised motifs and play with the opalescent effects of sapphire. These Hallmark of Geneva certified timepieces driven by a mechanical self-winding Manufacture-made movement, caliber 2460 RT are entirely designed, developed and created by Vacheron Constantin in a three-year process.